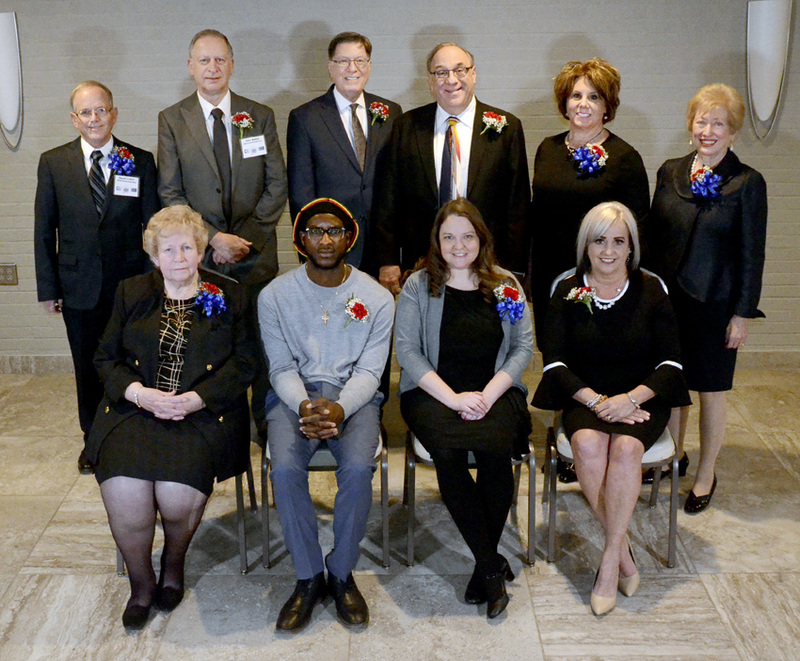 Tribune Chronicle / R. Michael Semple The 2019 Community Stars honored Tuesday at St. Demetrios Center in Warren by the Tribune Chronicle and Trumbull 100 are front row, from left, Donna Fowler, Miles Johnson, Lisa Ramsey and Barbara Vingle; back row, David Luther, Mike Bollas, Dr. Lance Grahn, Robert Berk, Linda Aggarwal and Janet Schweitzer. WARREN — Described as caring people who have stepped up to make a difference in the lives of others in their communities, 10 local residents received the 2019 Community Star award. More than 300 people attended the 18th annual Community Star banquet Tuesday at St. Demetrios Center, as five men and five women were recognized for going above and beyond in volunteering and helping others for the betterment of their communities. The event was co-sponsored by the Tribune Chronicle and Trumbull 100. Charles Jarvis, publisher of the Tribune Chronicle, said since the first year of the awards in 2002, more than 170 people have received the Community Star recognition. “It is an honor and privilege to recognize an outstanding class of recipients this year,” Jarvis said. Wanda Thomas, president of Trumbull 100, said everyone should want to emulate the 10 people honored are people. “One of the common elements of all the people being honored and what they are all about is the word caring. They all put other peoples’ needs above their own. They live by the golden rule and all go the extra mile,” Thomas said. She said the honorees inspire others to become more involved in their communities. • Linda Aggarwal of Warren, who helps her neighbors in various ways, is active with Blessed Sacrament Church and takes part in activities and promotion of the Down Syndrome Association of the Valley. “A friend of mine said we are all fixers and doers and we are the people who get things done,” she said. “Never say never is the motto I live by. You never realize the impact you have on others until you get involved,” Berk said. • Mike Bollas of Howland, past president of Warren Rotary, Guardian Angel volunteer and Someplace Safe treasurer, has been nicknamed “Mr. Volunteer.” He was involved in establishing the Memorial Wall for Warren G. Harding High School. “It is exciting and humbling to be recognized among this group of honorees. It is comforting to know all the caring people we have in our community,” he said. • Dr. Lance Grahn of Cortland, a member of Alliance for Substance Abuse Prevention and Junior Achievement class instructor, has been active with the United Way of Trumbull County. Grahn, dean at Kent State University at Trumbull, said all the honorees show they want to be involved in the community and help make the area thrive. 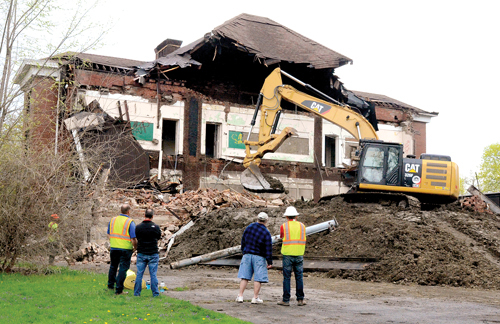 “We could not do all this by ourselves, but only in partnership and collaboration with other agencies and groups wanting to make Warren and this area a better place,” he said. • Donna Fowler of Warren, organizer of the Warren G. Harding High School Band’s Relay For Life team, is known as “the seamstress for the band,” having tailored Harding band uniforms for more than 40 years with 15 different band directors, and has acted as a mentor for students. “The support I have had for all these years has been fantastic. I do not know what I will be doing the day I leave that band room,” she said. • Miles “Jay” Johnson of Warren is a Men of Distinction mentor for students at Jefferson PK-8 and co-creator of “Chess is Life,” which provides free chess lessons in several area schools and to the public at the Eastwood Mall in Niles. “I truly believe this community and all those here is what helps our kids. I do this because I want to give back to the community that helped me to reach and achieve my goals,” he said. • Dave Luther of Howland, chaplain and member of American Legion Post 700, is an organizer of the annual Pearl Harbor & Beyond ceremony at Kent State University at Trumbull, who helped build a Wall of Honor, which lists the names of veterans who died from Trumbull, Mahoning and Columbiana counties, and also conducts a weekly Bible study at the Youngstown Air Reserve Station. “In our life’s journey it is important to have confirmation that you are making a difference. Live a life that involves making a difference,” Luther said. • Lisa Ramsey of Warren, treasurer of the Fine Arts Council of Trumbull County and member of the Trumbull County Historical Society board of directors, specializes in writing grants for FACT and the historical society. “I am sure all of you can find some time in your lives to help and invest in your community,” she said, encouraging her children to follow in the footsteps of the honorees. Schweitzer has been a member of the Warren Rotary for 30 years and is active at Christ Episcopal Church. “I am very grateful that in our town we have a newspaper that tries to emphasize the good things. It is important to emphasize the many people who do things well for the betterment of the community,” she said. • Barbara Vingle of Warren, an advocate for the Trumbull County Alzheimer’s Association and a Relay For Life team captain for more than 10 years, said it doesn’t matter what side of town you are from, but do what you can for others. “I try to dedicate my life daily to being the best I can be. There are so many who have supported me and helped me through my journey,” she said.